Let’s start from the beginning. To brew your coffee you need to grind your beans (or you can ask The Chimps to do this for you). Grinding coffee beans breaks your coffee into smaller pieces, lots of little pieces which helps extract the wonderful flavours by brewing it with water. The only downside is that these, now smaller pieces are more sensitive to oxygen. After time, the oxygen can ‘inhale’ some of the lovely smells and flavours of your delicious coffee. How can I keep my coffee fresh then? What’s that we hear you cry? How can I grind coffee for any brew method? This is where it can get a little geeky- but SO worth it! Depending on how you grind your coffee beans will depend on how quickly the water will pass through them and therefore how your coffee will taste. For example, if you grind the coffee quite coarse, similar to the texture of rough sugar, the water can pass through all of these pieces with ease and find all of the gaps. In comparison, if you grind your coffee very fine, like soft brown sugar, the water has to get its Jackie Chan moves on and fight harder to find all of the gaps and will, therefore, take longer to pass through. This is called under and over extraction and can lead to either sour or bitter notes in your coffee. 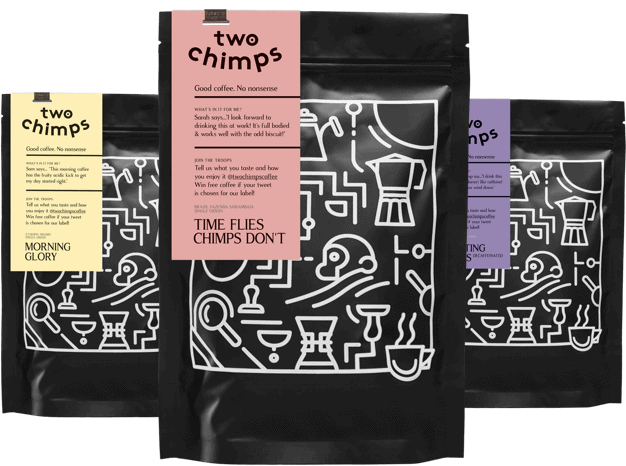 You have ordered some freshly roasted coffee from Two Chimps (High Five!) and asked for it to be ground for you to use in your espresso machine. The chimps would have set our coffee grinder to a setting that makes your coffee very fine- like soft brown sugar. When you put this into your portafilter, the espresso machine has the power to force the water through the very tiny gaps in the finely ground coffee. It will force water through your coffee grounds over around a 25 second period, and the taste will be delicious. Now you have your coffee that has been ground for an espresso machine; if you were to put this into your fancy Chemex for a dinner party, you might come across problems. The Chemex is a relative of the pour over brew method which allows the water to naturally drip through the coffee grounds, filter and then into the vessel. If the coffee particles are close together (finely ground), the water will have to fight harder to naturally drip through the gaps in the coffee grounds and therefore take longer to trickle through. This will lead to an over-extracted coffee as the water has sat in the grounds for too long. You will not be able to experience the coffee’s natural flavours as the bitterness will reap its ugly head! It is important to use the ground coffee for the brew method it was intended for. If you are totally awesome and are grinding your beans at home, we would suggest starting with a grind size recommended by the chimps below. Experiment with your grind and also your coffee/water ratio- it’s fun and amazing to see how much difference a tweak can make! Remember that we want you to enjoy making your coffee as much as you enjoy drinking it! For more tips, check out our brew guides for making coffee! If you need any help – “Hola” to the chimps!